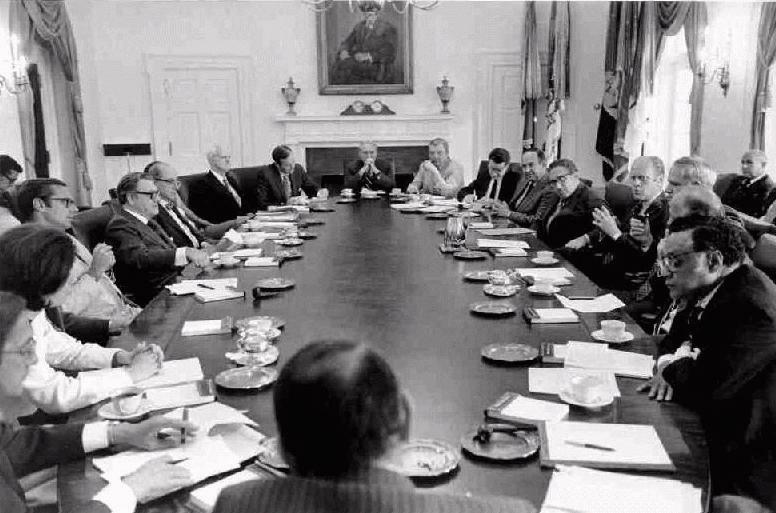 About once every three weeks, President Gerald R. Ford met with his Cabinet to gather information and discuss administration policies. Assembled were the ranking members of the executive branch. As many as 30 officials could be present, including Vice President Nelson A. Rockefeller, the 10 department Secretaries, the Attorney General, other officials of Cabinet rank, agency directors, and senior White House aides. For more than an hour, the participants discussed issues of high national priority that cut across departmental boundaries, such as foreign policy, the economy and relations with Congress. This online exhibit contains text and images of meeting minutes, biographical information on members of the Cabinet, and some background on Gerald Ford's use of the Cabinet. For most meetings during the first 14 months of the administration, the Secretary to the Cabinet (originally Warren Rustand and then James Connor) took notes and later created formal typed minutes. For meetings in the later months of the administration, Connor did not produce any minutes, although his files contain handwritten notes for some meetings. When formal minutes were not available for use in this exhibit, other documents, such as press briefings and memoranda of conversations, have been substituted to provide some substantial information on the discussions. The Library has extensive additional information on the Cabinet and Cabinet meetings for those who wish to research the topic in depth. Ford Library staff members William McNitt and Donna Lehman designed and constructed this online exhibit.